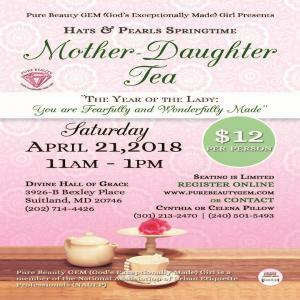 Hats and Pearls Mother Daughter Tea – Year of the Lady: You Are Fearfully and Wonderfully Made | Afro Puffs and Ponytails, Inc. Pure Beauty GEM (God's Exceptionally Made) Girl is excited to bring to you our first major event this year. Join us for our Hats and Pearls Mother Daughter Tea. The theme is "Year of the Lady: You are Fearfully and Wonderfully Made, Saturday, April 21. Pure Beauty GEM (God's Exceptionally Made) Girl is faith based organization whose visionaries are the mother and daughter team of Cynthia and Celena Pillow. 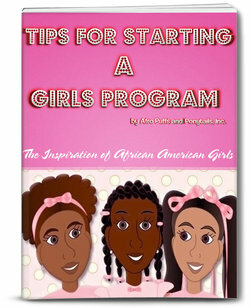 PBGEMs mandate is to influence, inform, and empower the lives of girls ages 7 through 17. To prepare their minds and hearts spiritually, morally, physically, and socially to be come the young women they are designed and destined to be. It is about building and strengthening the relationship between women and girls, mothers and daughters, mentor and mentees. Price $12 per person. Seating is limited. Last date to register is Saturday, April 14, 2018. Event Categories: Events, Events for Girls, and Mother Daughter Events.Event Tags: Events for Girls.